It may well have been a freezing cold and sometimes blustery winter’s day on the outside. 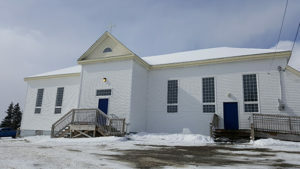 However, inside All Hallows’ parish hall, in the small town of North River, Newfoundland, Canada, it was toasty warm. 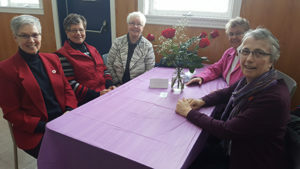 The air was full of fellowship and hearty welcomes, amidst much joy and laughter as over 100 women gathered to celebrate International Women’s Day 2019, hosted again by the town’s mayor, Joanne Morrissey, and a very special team of women, with attendance growing each year. The annual sold-out event was a virtual feast. 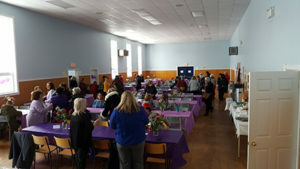 With tables decked out in a dazzling sea of purple, the traditional colour of International Women’s Day, and a bouquet of roses on each, women from the area as well as far reaching areas, gathered as one, in celebration, solidarity and hope, renewing and strengthening their commitment to foster greater dignity and equality for all women. A full house and indeed full hearts! 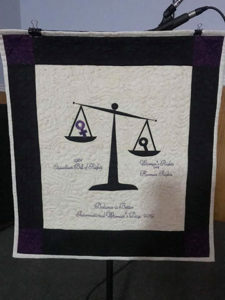 The theme this year: “Balance is Better.” In her opening reflections, Joanne touchingly walked us through time, highlighting the struggles, the strides that have been made and the challenges that remain. She has been involved in organizing International Women’s Day events since the 80s, she and so many women like her making a difference for all women. Keynote speaker was lawyer, Ms. Lynn Moore, well known as a vocal advocate for women’s equality and a devout feminist in the best sense of the word, fueling her work with the board of directors of the St. John’s Status Of Women and currently as the chair of the board of directors of Iris Kirby House and O’Shaughnessy House, two local women’s shelters. Like Joanne, Lynn touched our hearts, rekindled hope and called us to continue to champion the rights and needs of all women. 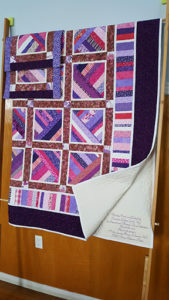 The quilted banner, made by Joanne, was given to Lynn in thanks. 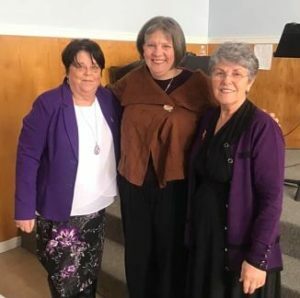 Pictured here are Mayor Joanne Morrissey (right), Ms. Lynn Moore (centre) and Ms. Betty Parsley, member of the House of Assembly for the local district of Harbour Main, (left). Ms. Parsley brought greetings and expressed deep gratitude to so many for so very much, while also passionately addressing a variety of mental health issues. In attendance and delighting to share in the cutting of the cake with Joanne following a truly sumptuous and locally catered meal of homemade style soup and sandwiches and all kinds of homemade style sweet treats and fresh fruit were 101-year-old Ms. Mary Flynn, and Ms. Sheila Power, former mayor of North River. 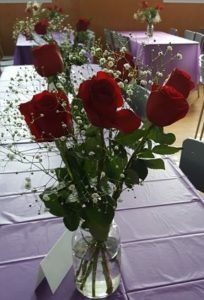 While the event was a celebration of all women and not primarily a fundraiser, the group took advantage of the opportunity to support O’Shaughnessy House which is a safe and secure transition house in the area for women and children escaping violence. It is named for one of our first four sisters to come to Newfoundland from Ireland in 1833. Staff and residents of O’Shaughnessy House were in attendance. O’Shaughnessy House is one of our former Presentation convents which closed in 2004 and was gifted for a women’s shelter in 2008. 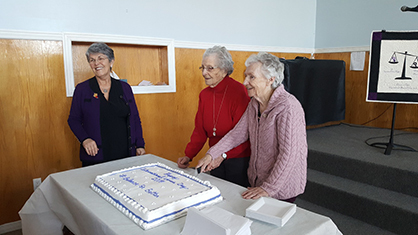 Together with Iris Kirby House, another women’s shelter already well established in the larger St. John’s area, and the Newfoundland provincial government, the long-awaited dream for this much needed facility had finally become a reality. Four of us as Presentation Sisters were happy to attend the dinner as a sign and a heart-felt pledge of our ongoing support. We indeed were very moved to have been invited to be part of the day’s celebration and were joined also by Doris’s sister, Kay, who lives in the area. Profound gratitude was repeatedly expressed for our initial partnership, and for our faithful support. We were asked to please be sure and pass that gratitude along to all of our sisters. Indeed we walk ONE with women everywhere as do those who put such energy and passion into this event and so many like it the world over, and have for over a hundred years! Everyone in the room happily went home with a beautiful rose from their tables! Earlier on in the afternoon, soft background strains of “Bread and Roses” could be heard ringing out through the hall. As we go marching, marching, in the beauty of the day, A million darkened kitchens, a thousand mill lofts gray, Are touched with all the radiance that a sudden sun discloses, For the people hear us singing: Bread and roses! Bread and roses! As we go marching, marching, we battle, too, for men, For they are women’s children, and we mother them again. Our lives shall not be sweated from birth until life closes; Hearts starve as well as bodies; give us bread, but give us roses. This song was originally posted on protestsonglyrics.net As we go marching, marching, unnumbered women dead Go crying through our singing their ancient call for bread. Small art and love and beauty their drudging spirits knew. Yes, it is bread we fight for, but we fight for roses too. As we go marching, marching, we bring the greater days, The rising of the women means the rising of the race. No more the drudge and idler, ten that toil where one reposes, But a sharing of life’s glories: Bread and roses! Bread and roses! Our lives shall not be sweated from birth until life closes; Hearts starve as well as bodies; Bread and roses! Bread and roses!